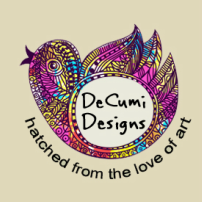 I am Debi Cummins, the hand behind DeCumi Designs. I work from my home studio in rural Northumberland where there is wide open spaces and tranquility which frees my mind to be creative. I live in a village surrounding Alnwick Castle, the ancient seat of the Percy family and recently known for being used as the film set for Hogwarts in the Harry Potter films. Being a self taught craftsperson, I love all types of hand made craftwork and my passion is making illustrated, anodised aluminium cuff bracelets which have a high quality shiny finish with vibrant artwork. The bangles are hypoallergenic being both lead and nickel free, they are non-tarnish, colourfast, water proof and fade resistant so can be worn by just about everyone. Their size fits an average medium to large wrist, 7 to 8 inches, and can be squeezed smaller or pulled larger to fit most wrist sizes. The designs are ink dyed with special pigments and hot sealed to make them permanent. The colours do not rub off so can be wiped clean if needed. They are comfortable to wear being both lightweight and sturdy. Wholesale enquiries are welcome. Please contact me for details, letting me know where you are based and your method of selling.